Anyone who wouldn't be excited for this experience is either incapable of excitement or has flown it so many times it's commonplace. I'm neither. One of the many thrills flying the Etihad A380 in first class is their onboard shower. This flight had only two occupants in first so I could use it anytime. With about 90 minutes before landing I decided to take the plunge. The Food and Beverage Manager and my main flight attendant on this flight, Yohaane, requested a couple minutes to prepare the shower. Instructions were given. Five minutes of water and when the lights turn only red I had one minute left. Taking a shower is something you typically do in the privacy of your home or when traveling in a hotel. Not on a plane. If fact it means you must get naked on a plane. What if we hit clear air turbulence and you get thrown to the ceiling and knocked unconscious? Do I really need a shower? I've been on many planes and it's not something that's required. What the hell, just do it. I undress and press the button to start. Water started to come out the shower head then in a moment it stops. Hmmm. I press it again. Nothing. I wait. Press again. Nothing. Ok then. I get dressed. Upon exiting the lavatory on the upper deck of this beautiful A380 Yohaane asks how I liked the shower. He looks devastated when I explain what happened. I say no big deal thinking to myself I did take a shower on a plane because I was actually in a shower on a plane and lived to tell about it. He says he'll reset the system and I can try again. I say that's ok, I don't really need a shower. He says please! Yohaane is by far the best flight attendant I've had in my close to two million air miles. How could I say no? He requests 5 minutes to reset and prepare the shower. I monitor turbulence carefully while he's gone. He returns, it's time. I undress, get in, press the button and water starts to dribble out. I contemplate what to do. Should I use the shampoo? Nah. Just rinse off. In the time it took to make that decision the water stopped. I press the button again. Nothing. Press it again. Dribble. Press it again. Nothing. I get dressed, not needing to dry off. What happens next is why Yohaane and the other attendant in the cabin, a young lady named Rylin, hold the record for world's best flight attendants in my book. As I opened the lavatory door, they are standing at the door armed with 6 liter sized bottles of water, prepared just in case I got all soaped up and the water shut down. Both were disappointed I did not get to use the shower. I insisted it was no big deal. Upon landing an Etihad representative met me in the jetway and took my contact information as the flight manager reported the incident. I was compensated for the shower malfunction. Update: The 10K points EY gave me for this shower situation turned into a fabulous deal. 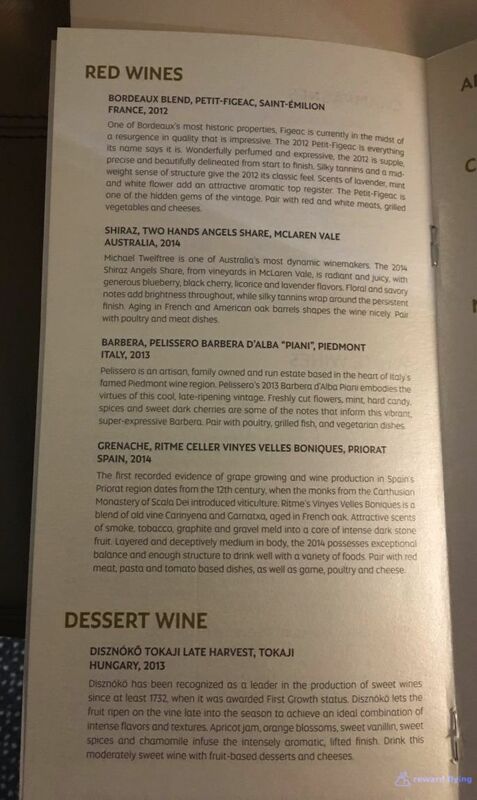 I booked an American Airlines first class ticket from SYD-LAX for 67,500 points, meaning it cost me a transfer of 58,000 AMEX points for this 15 hour trip in first class! Configuration: 9 First Class Apartments! 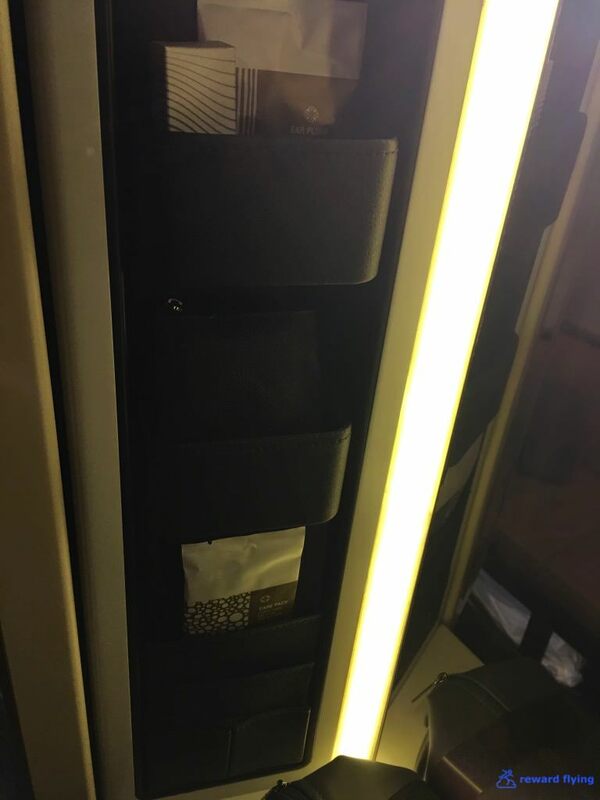 Etihad is reasonable when it comes to releasing reward space. While they're not consistent, if you are patient and flexible you can typically find a suitable reward. Certain routes are extremely difficult, i.e. Chicago to Abu Dhabi, but others like the JFK route, which will soon be served twice daily with A380s, have better odds of finding a seat in a premium class. 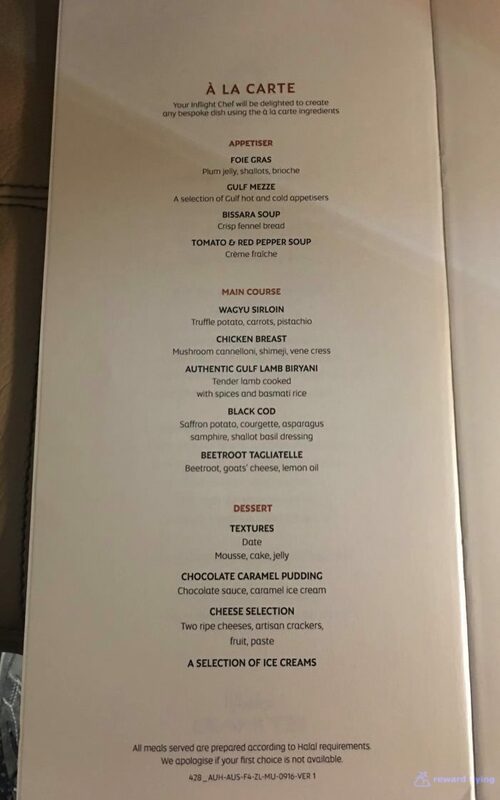 The one-way retail fare for DOH-ABU-MEL was $6,120 in first class. The reward was booked pre American devaluation for 60,000 points. That gives a 10 cent per point redemption value. Now the reward would cost 100,000 points. That is still 6 cents per point. Ticketing was the hardest part of the trip. It is well documented the United States call center for American Airlines does not see Etihad reward space all the time. Sometimes they do, sometimes they don't. The work around is to call the Australian or Singapore call center. It's easy, download Skype if you don't have it, spend $5 for an international call package and dial +61291011948 for the Aussie center. Be persistent. I had an agent who saw the space then asked me where I was from. When I stated the US suddenly the space wasn't available. So I thanked her hung up and called again. You can either ticket it with the Aussie center or put the reward on hold and call the US to ticket. The call only costs pennies by the way. The only thing I could do with the Etihad mobile app was check-in and get a boarding pass sent to my electronic wallet. The cabin is stunning. With warm natural tones the cabin oozes elegance and not bling. You're upstairs on the A380. At the front of the upstairs cabin is a staircase down to the lower level, where you can see another stairway to the flight deck. To the left is The Residence which was unoccupied. On the right are two large lavatories. One with the dysfunctional shower and the other just as big but without the shower. That one would turn out to be the dressing room. Not an Apartment but looks inviting for a comfortable long haul trip. Between the galley behind first class and in front of business class is the bar. This photo is before departure. I was so comfortable in my suite I never went back during the flight! Let's take a tour of my Apartment. Some Apartments are dressed in beige leather while others are a chocolate brown. If you like beige get 3A, darker get 3K, or just roll the dice. I chose a rear facing seat. Yohaane seemed puzzled and offered a forward facing seat claiming most don't like facing backwards. I like it. This is not your typical airline seat. You get a mini-bar. And a personal closet to hang your clothes. Along with a well stocked vanity which no doubt is very handy for the ladies. Multiple seat adjusts via an electronic touch pad. Or the old fashioned route. Yohaane offered to make my bed in one Apartment and I could sit in a different Apartment. I had my choice! It is impossible to get a better sized bed on an airplane, unless say you are in the Residence on Etihad's A380. I settled for this. The little touches do make a difference. The bed was just hard. I couldn't sleep. Excitement? Rather rather enjoy the ride? Maybe but the bed was hard. The amenity kit was provided is what I can best describe as the travel shaving kit my dad had when I was a kid, a long time ago that was. The FA Rylin was excited to tell me about an essential oil provided in the kit that assured a good night's sleep. Maybe I should have listened to her. Inside the kit was a pouch of Omorovioza skin care products. And if you wanted a shave, head over to the lavatory for the convenient mirror. Once on board Yohaane entered the suite with this presentation of my sleepsuit. I decided to change before departure. Yohaane stopped me before reaching the lavatory. He took the bag and requested I return to my seat and he would summon me in a minute or two. Yohaane can not be called a flight attendant. He is more like a personal butler. And we haven't even departed yet. Rylin offering some Bollinger, the same as served in the lounge along with an oshibori. Then Yohaane served some Arabic coffee. Explaining that you take a sip after taking a bite from the date to cut the bitterness of the coffee. A card offered a personal greeting from the Cabin Manager. 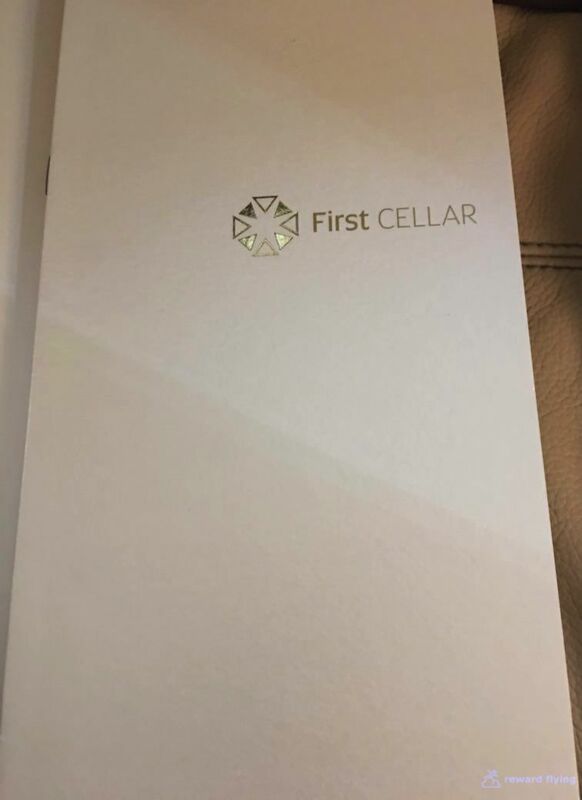 As you know it's common when flying international first class to have the purser or cabin manager introduce themselves at the beginning of a flight and thank you at the end. 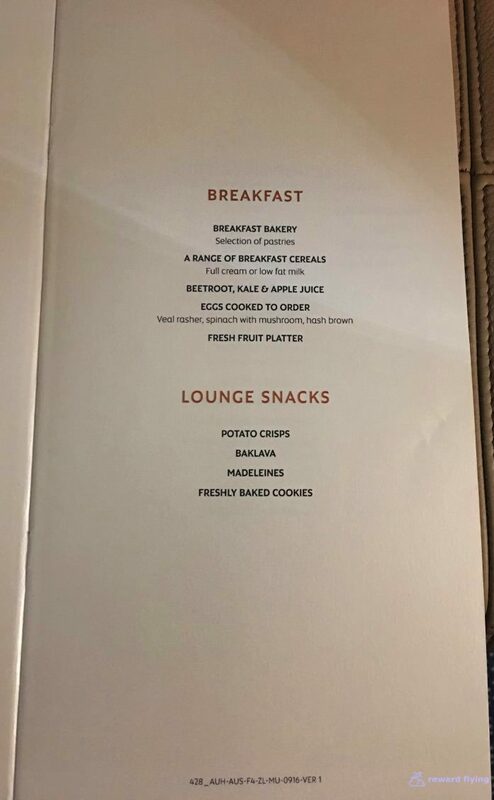 This practice is not limited to first class as a number of business class airlines do the same. The cabin manager on this flight was Rupoc Al Kamal. Rupoc was someone who could sit and talk to you as if you've been best friends years. His visits were more than an introduction, he sat down and had a chat. With me not once or twice, but three times and he genuinely appeared to enjoy all of them, as I did. And he was proud of his crew, for good reason. The beverage menu was sufficient and not over the top. 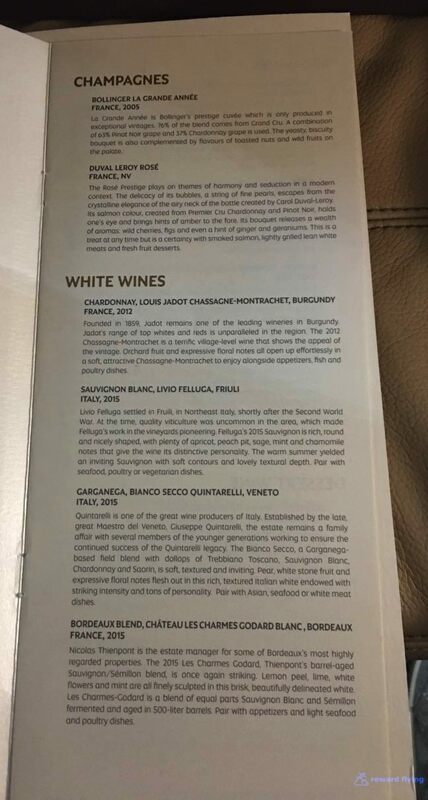 I selected a bordeaux, which was offered white or red. A misunderstanding wasted a white, don't they know me???? Dinner began with an Amuse. It was a candied walnut with dried beetroot and goat cheese. Can I say highlight? Next up was a simple lemon sorbet to cleanse the palette. The foie gras was tasty but extremely rich and too much. I only ate half. Dinner was served with a choice of breads along with olive oil and butter. It was overdone, dry and a disappointment. I'm regretting not having the Emirates Palace at the lounge. Next was the Texture dessert. It was fine, but not memorable, at all. After my short nap I ordered breakfast. Nicely poached eggs, it was, well, good for breakfast and even more so on an airplane. 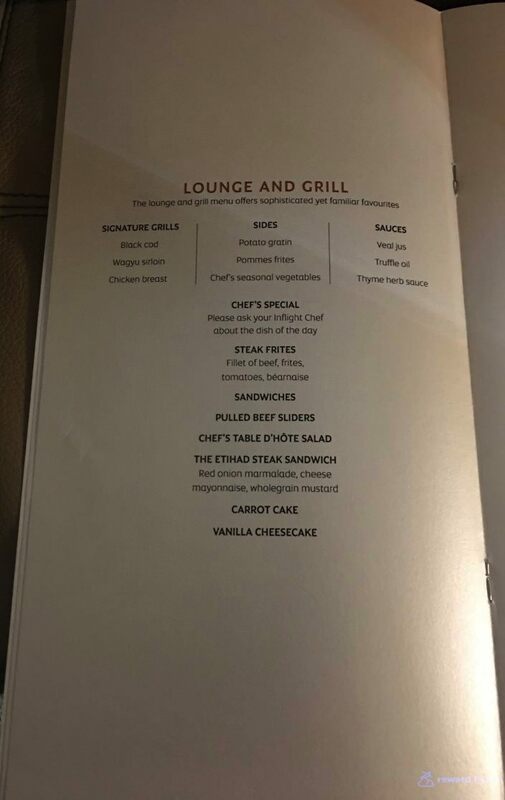 The Etihad Steak Sandwich before landing was ok as well. Served with ketchup and stone ground mustard with real french fries, so that has to count for something! Yes, I was disappointed with the food. Everything was nicely presented, but for me there just wasn't a wow factor in any of the dishes. ✔︎Can I stay and watch some more? A general greeting was sent to all the passengers on this Etihad A380 flight to Melbourne. The monitor is huge. It's mounted on the wall so you feel like you are sitting at home watching the big screen TV. The controller annoyed me, so much so I forgot to take a photo of it. The selector was this little tiny ball that you had to press. If you didn't do it perfectly then it moved the selection frontwards or backwards. Give me a button! The selection was good. I found the current season of House of Cards that passed the time away. Over the Great Australian Bight headed to Melbourne. Wi-Fi was available on this flight. I chose a reasonable $12 for 2 hours of time package. Speed was pretty good as well. As you've ascertained by now my opinion of this crew was they were incredible. But I'm not done. Sometime after dinner as I was spaced out watching TV, while the rest of the plane slept, Yohaane knocked on the door. (Numerous times I told him it wasn't necessary to knock, but he still did.) He thought I might like a special cocktail which he prepared for me. It was non-alcoholic. I forgot the ingredients but it might have been the beetroot and apple juice drink on the menu. It was excellent and extremely thoughtful. Later as I was waiting for breakfast Yohaane knocked again, and delivered the morning paper. Sometime after breakfast another knock at the door. Yohaane thought I'd like a coffee and some warm cookies. The A380 is a great plane. Very smooth. Very quiet. I just dislike the windows on the upper deck. 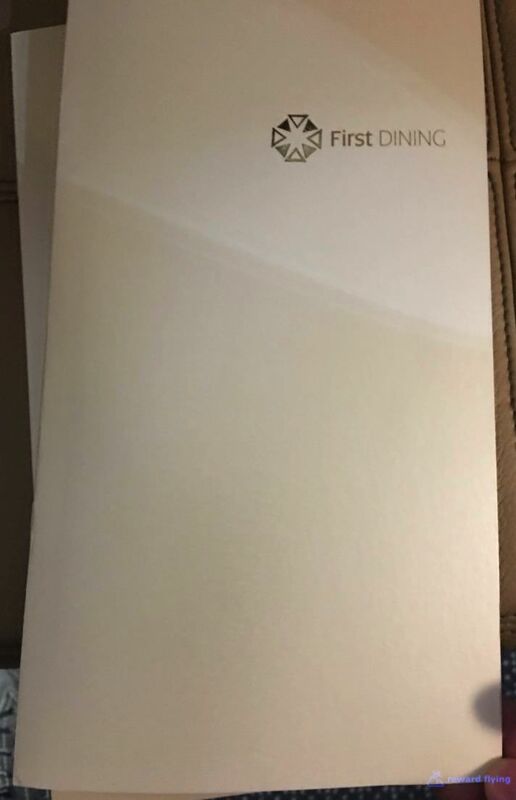 Reviews of the incredible experience flying with Etihad in their first class Apartment can be found on many blogs and Youtube videos. My experience was equally gratifying. 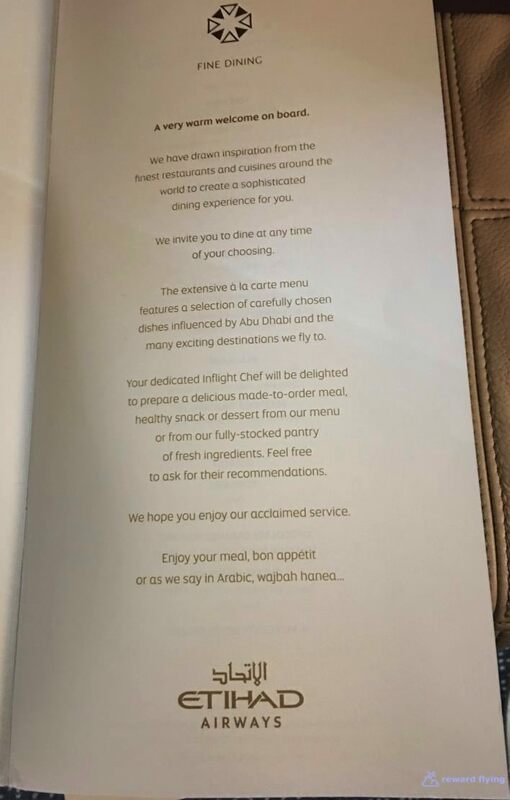 And the fact that there was a minor issue with the shower, and how the flight crew dealt with it, only exemplifies the extent Etihad will go to treat you as a very special guest. I hope to fly with them again, and pray Yohaane is my Food and Beverage Manager. Do you have any Etihad Airways experiences you'd like to share? Feel free to leave a comment.